Throughout his career, Larry Holmes had been underestimated. When he started fighting his way up the heavyweight ranks while also working as a sparring partner for Joe Frazier and Muhammad Ali, no one thought he was championship caliber. Even after he defeated Ken Norton in a thrilling 15 round classic to win the WBC version of the title, he couldn’t get his just due. In 1980 many thought a decrepit Ali could defeat him, and after that the pundits gave challengers Leon Spinks and Gerry Cooney solid odds to take his crown. Instead, Holmes went on to rack up 20 successful title defenses and he’s now generally regarded as one of the best heavyweights to ever step through the ropes. But in 1988 he was still being underestimated, specifically in regard to mass appeal. So perhaps the people staging Holmes’ showdown with Mike Tyson could be forgiven for thinking it wasn’t a match-up worthy of exposure on closed-circuit or pay-per-view, instead opting to air it on HBO. After all, Holmes was old, unpopular and had been out of action for almost two years. And surely it was a foregone conclusion that Tyson, easily the most impressive heavyweight anyone had seen in years, would dispose of Larry with little difficulty. 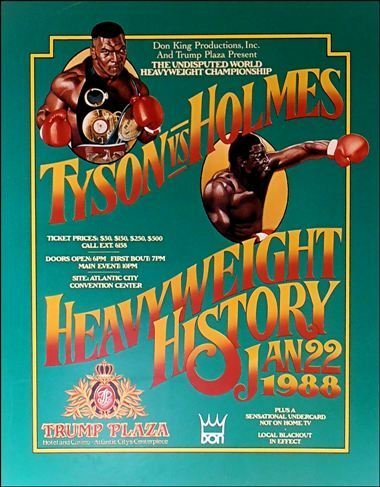 Tyson vs Holmes was an intriguing match-up, but it lacked mass appeal. Right? And yet, come fight time, as the two gladiators strode through a sold-out Atlantic City Convention Hall surrounded by their respective entourages, the electricity in the old arena was palpable. Afterwards, more than one observer marvelled at the tension in the air, noted the goosebumps ringsiders had. Even the organizers of the bout, including Donald Trump, were surprised at the degree of anticipation and excitement. What they had misjudged was the power and appeal of a classic storyline, and what they had overlooked was that Larry Holmes, despite his graceless comments, represented greatness. No one could deny that. And since most agreed Holmes had been robbed in the second Spinks bout, a Tyson vs Holmes match offered another rendition of that stirring and timeless old tale: the clash between the wise, old king and the bold, young usurper. This was a match for heavyweight history, as well as a bellwether bout for Mike Tyson. People wanted to know: was he really as awesome as he appeared? This force of destruction who had bested virtually every serious contender in the division, was he a candidate for the pantheon? Or could the canny old veteran expose him, find the chink in the armour, the unseen weakness, and rob him of his power? 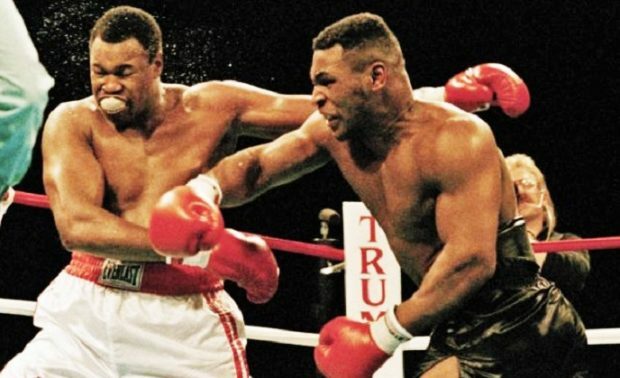 Others would eventually take advantage of Tyson’s shortcomings, but in fact this was Iron Mike’s peak. His unique blend of power, quickness and ferocity would never be more potent. At the opening bell, Holmes appeared startled by Tyson’s speed as the young champion bore in and unleashed wicked shots to the body. Forcing the former champion to continually backpedal and clinch, Tyson gave Larry no time to set himself, no chance to find his rhythm. The veteran tried in vain to land a big uppercut or right hand to get Mike’s respect, but his timing was woefully off. The pattern continued in the second: Tyson pressing, landing to the body, Holmes retreating and clinching, even scurrying out of harm’s way to avoid being cornered. In the third, Holmes started timing the young upstart a bit better and landed a sharp right hand and a few uppercuts on the inside, but Tyson remained the more effective fighter, his two-fisted assault forcing Larry to clinch again and again. 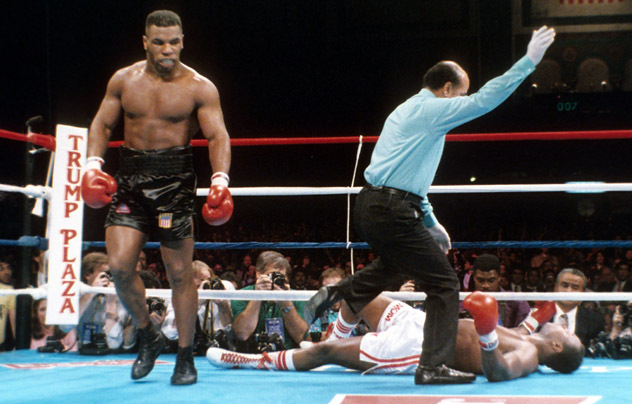 Tyson had won the opening three rounds but he appeared frustrated with the constant holding and wrestling as he got in a blatant low blow near the end of the third and a left hook after the bell. In the fourth Holmes gave the nostalgic in the crowd a bit of what they had hoped to see. Up on his toes for the first time, he circled the ring with seeming authority, snapping home several quick jabs, for a moment looking something like “The Easton Assassin” of old. But the vision was fleeting. Holmes’ 38-year-old legs could not maintain that posture for long and soon enough it was back to grappling and clinching and trying to slow down the younger, faster man. 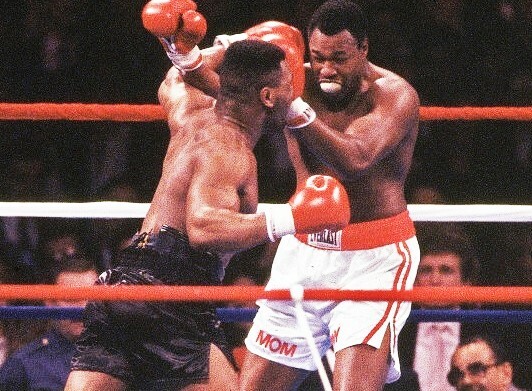 But Tyson never stopped throwing big punches with bad intentions and finally one got through cleanly. Midway through the round Tyson nailed Holmes with a perfectly timed overhand right that put Larry down hard. Shocked as much as hurt, the old champion made the novice mistake of getting up too quickly from the knockdown, his head still ringing as Tyson tore back in and sent him down a second time, and again the proud Holmes was upright in seconds. Tyson pursued as his dazed quarry reeled about the ring, trying to regain his equilibrium, taking punch after punch. A series of right hand clouts drove Holmes to the ropes where he planted himself, timed Tyson as he came in, and then let go with a huge uppercut. But the punch never happened; instead Holmes’ fist got snagged in the ropes. A second later Tyson landed the coup de grâce, a final right flush on the jaw that put Holmes flat on his back. The referee waved his arms over the fallen old warrior as officials and cornermen flooded the ring. Its a shame the career of Larry Holmes was sandwiched between the greatest heavyweight of them all in Muhammad Ali, and the most exciting Heavyweight(probably of any weight) ever in Mike Tyson. He is almost the ‘forgotten’ Heavyweight champ but he was certainly a great champion and Boxer. If Holmes fought in another era, such as todays, he would receive the recognition he deserves. Holmes had been woefully unprepared for the fight by a crafty Don King. As both Holmes and Foreman have reported, Don King would show up with a contract about a month to two weeks out and a bag of money, and then demand you sign it or be done with him and future earnings. Holmes claimed he turned down the first offer and took the second, but unfortunately showed up somewhere around pre-camp shape with the aforementioned results. There are no absolutes. This all about money that boxers take risks of getting seriously hurt. Holmes got a real beating from Tyson. He still went on to fight Butterbean at age 52. He got some cash there. Is this all a scheme to get richer? Between Berbick and Spinks, Mike Tyson was one of the greatest heavyweight FIGHTERS of all time – and a damn good champion – by virtue of his unique blend of frightening speed and atomic power. One Tyson left hook dropped durable champ Trevor Berbick three times; a blinding Tyson combo put iron-chinned Pinklon Thomas down for the count; another hard man in Tony Tubbs was dismantled in seconds by an Iron Mike rampage; and, of course, undefeated, never-floored, always-victorious Michael Spinks was vaporized in 91 seconds. 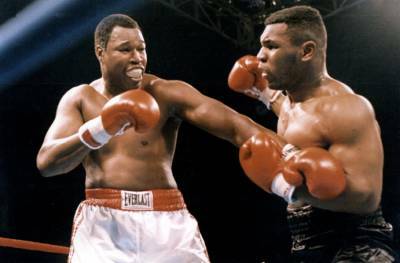 But it is what Tyson did to the great Larry Holmes that shows – for anyone who wants to see – that with Mike Tyson, it will never be how long or illustrious his reign was – though it was a 9-defense reign of terror. It will always be about HOW devastatingly, compellingly, utterly he vanquished his victims that shows how great this orphan with no one and nothing to fight for accomplished and maintained from ’86 to ’90. 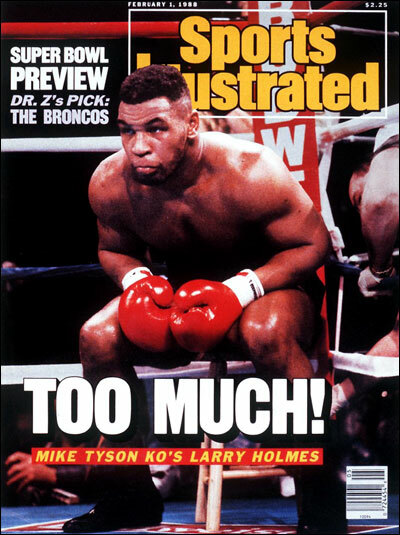 Holmes’ later successes – with Tyson safely in jail – as an even older man against ’90s heavyweights shows how head-and-shoulders Mike Tyson was above merely good (Mercer) and even great fighters (Holyfield). All this is why Mike Tyson is still revered today, and will always be among the elite of the heavyweights. Yeah….none of that is true except the reverence part. Tyson was and is highly overrated and has no prime non-journeyman scalp on his resume. You make some terrific points, Angel. But Holyfield kicked the crap out of Tyson twice, both fights when Mike was still at a great age for boxers. Mike got so frustrated he had to disqualify himself so he wouldn’t get stopped again. Holyfield was just a better fighter. I must mention too, the only names you mentioned that were really good as fighters were Holmes and Tyson, the rest of those guys (including Spinks) weren’t great heavyweights by any stretch of the imagination. That said, Iron Mike may have been the most amazingly savage (and heartless, meant in all ways possible) heavyweight whom ever lived. 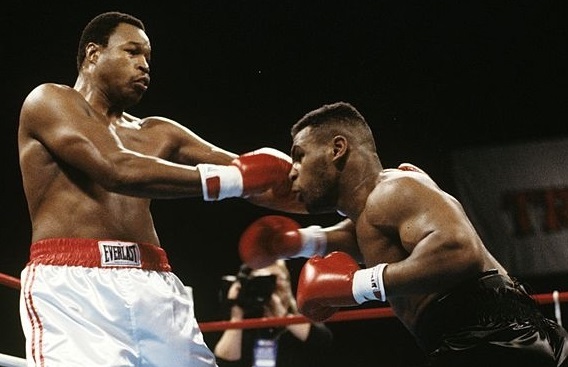 It’s just that Tyson didn’t have any competition during the 80s …he got so used to people (including Spinks and Holmes) being afraid of him that a revved up Buster Douglas slaughtered him. Any time he fought someone great (Holyfield, Lewis) he was beat. He never showed any real heart during any of his fights. Granted, there was no one around in the 80s to be Ali to his Frazier (if there had, he would have been knocked out much earlier), Ray Robinson to his LaMotta. Both Holmes and Holyfield had that heart in spades; that part that makes a champion out of even folks whom aren’t champions of anything.